Magnesium sulfate is not known to cause adverse effects in small doses. However, it may cause bothersome, persistent, unwanted or even some serious effects in rare cases. In general, patients using magnesium sulfate tolerate the medication very well. They respond very different to the heightened magnesium in the serum, and these excessive serum levels are responsible for the most of the side effects. Patients receiving rapid bolus infusions of magnesium sulfate can experience flushing and passing hypotension because of the vasodilatation provoked by the medication. If a person’s magnesium serum level goes over 3 or 4mEq/l (milliequivalent per liter) there is a possibility to experience some depression of the central nervous system (the brain). It can be manifested as confusion, disorientation, depressed reflexes, dilated pupils, hypotension, hypothermia, lethargy, flushing, sweating, flaccid paralysis or frank coma. Some patients may experience cardiovascular depression or circulatory collapse. Magnesium serum levels higher than 11 or 13mEq/l may cause paralysis, respiratory depression, asystole or heart block. All these unwanted magnesium effects are easily antagonized with intravenous calcium. Studies have established the connection between the long-term uses of magnesium sulfate for the treatment of tocolysis in pregnant mothers and bone problems in unborn children. There might be some rachitic changes, dental enamel hypoplasia or hypocalcemia in children whose mothers were treated with this medication. 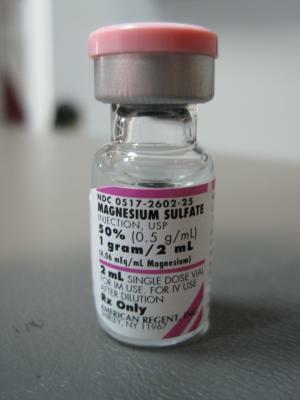 Patients treated with magnesium sulfate could also experience: hypomagnesia leading to hypocalcemia or hypokaliemia and provoking: nausea, vomiting, weakness, lethargy or anorexia. There were also some cases of hypercalciuria and reversible maternal hypothermia. In rare cases, when the magnesium level in the serum gets around 5mEq/l, patients might suffer from paralytic ileus, nausea or diarrhea. Magnesium sulfate is known to cause some depression effects on the central nervous system in higher doses, while therapeutic doses for the seizure treatment in eclampsia and preeclampsia are not known to cause any unwanted effects. Hypermagnesemia can cause muscle weakness, mental confusion, sedation and decreased tendon reflexes, hypotension and slower than normal respiratory rate. Magnesium levels above 10mEq/l may provoke mental depression, coma, areflexia, respiratory paralysis or even curare-like effects. There were some reported deaths, especially in patients whose magnesium was over 15mEq/l. Additional side effects of magnesium sulfate include cardiovascular, ocular, respiratory and hypersensitivity reactions. Patients have reported flushing, hypotension, bradyarrhythmias and asystole. Cardiotoxicity is even more prominent if associated with acidosis, kidney problems, digitalis treatment and hypocalcemia or hyperkaliemia. People treated with magnesium sulfate may also experience pulmonary edema or respiratory arrest, double vision or dermatologic problems as the side effects of the medication. What Happens When You Mix Alcohol With Heroin? What phentermine does and what it does not? Does Risperidone Flatten Your Mood?